Six Days War & Weather? Was June 1967 a cosmic turning-point in more ways than one? ...The pre-drill work with residents is as important at the drill itself. "It will be important for us to gain the trust and confidence of the residents of Arcadia," said Kots. "We will need to identify individuals that are willing to assist us in training by allowing us to search their homes and vehicles and to participate in role-playing." Weep over the Jews that patronize this place and enable the messianics to succeed and remain here. Ayelet Ronen, secretary of Yad Hashmona, a moshav of Messianic Jews and Christian Zionists in the Jerusalem hills, comes from an aristocratic Israeli family. "I'm a fourth-generation Messianic Jew," she says in the reception area of the moshav's bed-and-breakfast. The interior is of lacquered logs and looks very Scandinavian because the roots of Yad Hashmona are Finnish - it was founded by Finnish Christian Zionists in 1971, then augmented by Israeli Messianic Jews including Ronen's father and two uncles. Today about 100 people live there, mainly Finns and Israelis, says Ronen, 36, a high-spirited mother of five married to Daniel, a Finnish Christian Zionist. Ronen's maiden name was Bar-David, and the family's Messianic roots go back to her Jewish great-grandparents in Sofia, Bulgaria, who turned to Seventh Day Adventism. Her grandparents moved to Palestine in the early 1940s ahead of the Nazis and founded one of Israel's first Messianic Jewish congregations, in Ramat Gan, which Ronen attended as a girl. "It was very straitlaced, the women wore head-coverings on Shabbat," she recalls. "We sang three songs, there was no raising of hands, nothing emotional, no hallelujahs. The first time I saw Messianics carrying on like that, speaking in tongues, I thought they were crazy." Every year the moshav gets tens of thousands of Israeli tourists passing through on weekends, drawn by the buffet and the scenery, while the auditorium brings in conferences. On the Friday I was there, the National Insurance Institute was holding one. "Government offices love us," she says. "We've had groups from the Israel Police, Income Tax Authority, Justice Ministry, Health Ministry. A lot of times they want to know about our beliefs, and I tell them. Sometimes we get into big debates." The moshav also maintains the ruins of a Second Temple-era synagogue from the Golan Heights, which it got from the Antiquities Authority. "We get families doing bar mitzvas there and having their Shabbat meal in our dining room," she says, noting that the kitchen has "the lowest possible kashrut license" - from the regional authority's rabbinate. While Yad Hashmona does not get haredi visitors, it does attract lots of "crocheted kippa" Jews, she says. "We don't allow loud music or excessive drinking or accept money on Shabbat; we dress modestly; it's quiet and peaceful up here. Observant Jews like the Shabbat atmosphere," she says, adding that while Yad Hashmona doesn't advertise itself as a community of Messianics, she assumes that many if not most visitors know. Conference groups of any nationality or ethnic group are welcome, she says, but religious or spiritual themes are limited to Judaism and Christianity. "No yoga, no Eastern spiritualism, either," she says. "We're not liberal. I believe God is a jealous God. We're open to discussion, but this is a biblical community." "A Light to the Nations"
(IsraelNN.com) At the express invitation of the Chinese Government, Rabbi Binyamin Kluger of the Yad L’Achim anti-missionary organization and Raphael Aron, Director of Cult Counseling Australia, spoke at a four-day conference in southern China on cult-fighting strategies. The two bearded Orthodox Jews stood out blatantly at the late-January conference, the International Forum on Cultic Studies, which featured some 30 anti-cult experts from China, Russia, Ukraine, England, France, and the United States. The conference’s overall objective was to discuss ways to combat the influence of the Falun Gong cult in China, with the Chinese eager to learn from the experience of experts from around the world. "This photo provided by ModelWorks shows the 'Bernie 'he made off with my money' Madoff' character doll that is being shown at the American International Toy Fair at the Javits Center in New York on Monday, Feb. 16, 2009 ." NEW YORK (AP) — Mad at disgraced investor Bernard Madoff? There's a toy just for you. 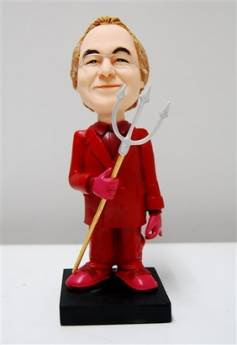 One of the vendors at this week's Toy Fair is offering the "Smash-Me Bernie," a $99.95 Madoff lookalike doll that wears a devil-red suit and carries a pitchfork. It comes with its own hammer — so you can pulverize it. Phoenix, Ariz.-based ModelWorks is behind the caricature Mini-Me figures, which can be customized to look like celebrities or whomever a buyer chooses. Madoff was arrested in December after investigators said he confessed to his sons that he had swindled investors of $50 billion in a Ponzi scheme. ...Latest Quentin Tarantino bloodfest, "Inglourious Basterds"
The first trailer of Quentin Tarantino's latest film, which stars Brad Pitt as a Nazi-killing commander, was released today. Inglourious Basterds sees Pitt play commander of the unit, Lt Aldo Raine, who sets about on a mission to kill and dismember Germans during the Second World War. The film - inspired by 1978 Italian war movie The Inglorious Bastards - follows a band of Jewish-American soldiers dropped into France to spread terror among the Nazi occupiers. The Basterds soon cross paths with a French-Jewish teenage girl who runs a cinema in Paris which is targeted by the soldiers. Inglourious Basterds features a large cast including Brad Pitt, Mike Myers and Samuel L. Jackson and is due to be unveiled at the Cannes Film Festival in May. It is scheduled for release in Britain in August. I don't like spelling it out so plainly, but I find that many people seem incapable of connecting the dots without some assistance. I remember hearing something about "hitting the ground running" in light of all the dire warnings amid unprecedented, monumental problems facing the United States. It appears that this has been forgotten in the dazzling light of presidential celebrity and pomp. Barack Obama may have found that he is more interested in being ruler than in actually ruling. After pushing Congress for weeks to hurry up and pass the massive $787 billion stimulus bill, President Obama promptly took off for a three-day holiday getaway. Obama arrived at his home in Chicago on Friday, and treated wife Michelle to a Valentine's Day dinner downtown last night. The couple was spotted leaving upscale Table Fifty-Two, which specializes in Southern cuisine, with the first lady toting what appeared to be a doggie bag. 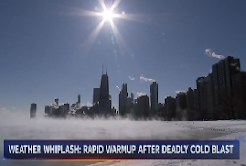 The president plans to spend the Presidents' Day weekend in the Windy City, and is not expected to sign the bill until Tuesday, when he travels to Denver to discuss his economic plan. Both the House and Senate passed the bill Friday night. The push to get the bill through before the holiday weekend was so frantic, members of Congress didn't have a chance to read all 1,071 pages of the document before they could vote. (CNN) -- During the first couple of weeks of his presidency, Barack Obama has made good use of his "spiffy" new ride. The president, who has made several trips around the country in Air Force One, was particularly excited during his first trip on the plane as commander in chief when he flew recently to the House Democrats' annual retreat in Williamsburg, Virginia. ...As president, Obama's first ride on the helicopter Marine One to Andrews Air Force Base, where Air Force One is kept, also seemed to leave him impressed. "It's spectacular," Obama said. "You go right over the Washington Monument, and then you kind of curve in by the Capitol. It was spectacular." It took Barack Obama two years to get to the White House, but barely more than two weeks for wanderlust to set in. "He's a bit of a restless soul," Press Secretary Robert Gibbs said Friday when asked if Obama was feeling "cooped up in the White House." Saturday, Obama and his family are due to head for Camp David for their first overnight stay at the presidential retreat in Maryland's Catoctin Mountains. ( In case you needed an example.) Why should anyone care about an eiruv? Who even knows it's there unless they go looking for it? The Israeli people voted and 65 Knesset seats were won by "right-wing" parties---a clear majority. The people spoke, but what will they get in return??? ...Rather than leaning on right-wing support, Netanyahu hopes to coax both Livni and Labor leader Ehud Barak to join his administration. Traitors and self-servers all. A bunch of US-owned and controlled puppets!! Sorry if it hurts any American readers feelings, but it's the truth. Your country has run amuck around the world deciding who should be ruling as a puppet for them while they try to maintain control over the American Empire. Beware! Those days are swiftly coming to an end. Their weapon for conquest has been the the dollar and the dollar is dying. US officials are publicly taking a wait-and-see approach to the formation of a new Israeli government, but privately many have expressed concern that Likud leader Binyamin Netanyahu might preside over a right-wing coalition. "There would be great unease" at the prospect of such a government, said one Capitol Hill source. ...The Capitol Hill source, who didn't want to be identified speaking about another country's internal politics, noted that Netanyahu had made a strong effort to reach out to the Obama administration and made the case to the US and the Israeli public that he could work with the White House. He said that attitude could help assuage US concerns when presented in a national-unity package, whose positions - whether under Netanyahu or Livni - would be more in line with the US's own policies of engagement on Arab-Israeli reconciliation. "The hope is that there is a government that is really committed to peace with the Palestinians," The Washington Post quoted one senior administration official saying. Even if Netanyahu prevails, the official added, "he's grown over the years. Getting back to the talks with the Palestinians is really the only solution." ...Still, many political analysts say there's no doubt the Obama administration would prefer to see a national-unity government headed by Livni. "The impression in Israel is that the Obama administration has already made its preference known and that its preference is for Kadima - and that impression isn't going anywhere," said Georgetown University professor and Israel expert Michael Oren. ...Dennis Ross, Clinton's Middle East envoy and likely to be a top regional representative, described Netanyahu as "overcome by hubris" after his first election to the premiership and recalled him being "nearly insufferable, lecturing and telling us how to deal with the Arabs" in his book on the Oslo peace process. ...Still, publicly US officials are welcoming the Israeli democratic process and indicating their readiness to work with whoever becomes prime minister. ... "We certainly hope that a new government will continue to pursue a path to peace. I see no reason to think that a new government would do something otherwise." ...He added that if the US expressed its preference for Livni too loudly, it could backfire and hurt her position. He compared the situation to the boost in the polls Israel Beiteinu leader Avigdor Lieberman received from the police's pursuit of corruption charges, since some of his supporters felt he was being unfairly targeted. "It could boomerang, just like Lieberman picked up [support] from the police investigation," he said. But then again, Netanyahu is highly suspect. One has to take even such a report with a grain of salt since the media lies and is itself used to manipulate public opinion and perception. Like most men, I suspect Obama has two coat pockets---one the left for Tsipi and one on the right for Bibi. If I'm right, watch out for a national unity government despite Netanyahu's protestations. And here is another 'cute' piece in the puzzle. Going back to the first article and in reference to Netanyahu: "He's said his biggest mistake when he was prime minister last time was not reaching out to Shimon Peres," who then headed the Labor party, Dermer said on a conference call with the United Jewish Communities and the Jewish Council for Public Affairs. "I do not believe he will make the same mistake this time." And lo and behold: "Fifty MKs have declared support for MK Netanyahu, lending strength to the prevailing view that President Shimon Peres must give him the nod to form the next government, inasmuch as that task must fall to the party leader who has the most support." We sent a message with the four seats won by NU, but a pitifully weak one. Do you see now why this system has to go!??? Already a few years ago, we were told that about 20% of the IDF takes it's oath on the "New Testament." There are those who so worship the armed might of the pretend-Jewish state that they openly advocate for automatic citzenship for anyone who will do military service. 'Fredrik" recently finished basic training in the 51st Battalion of the Golani Brigade. Together with thousands of other soldiers, he is waiting on a base a few miles from Gaza, ready to be deployed in case the cease-fire collapses. The only difference is that he is not an Israeli citizen, or even Jewish. He is a 29-year-old Swedish Pentecostal Christian. ...IDF conscription office in the summer of 2001, where he explained that he wanted to join the IDF. He received a resounding no for an answer, since he was not a citizen, nor Jewish. He was not even a legal resident, only a tourist. "That was when I first heard of Sar-El, an IDF volunteer program. You essentially become a jobnik." Between 2002 and 2005 Fredrik spent a total of a year and a half as a Sar-El volunteer, mostly as a tank mechanic. The rest of the time he worked odd jobs in Sweden to support himself in Israel. "Finally, after endless petitions, I got temporary residency." He immediately went back to the conscription office, but was told that he needed permanent residency to be eligible for the IDF. Fredrik worked odd jobs here for more than two years, doing everything in his power to make his dream come true. "When it was time to renew my residency, I felt that it was now or never. I wrote to everybody I knew and used all the contacts that I had made in Sar-El." And finally, in the summer of 2007, he was granted permanent residency. "As soon as I had received my blue identity card, I walked straight from the Interior Ministry to the IDF conscription office." All those years of persistence finally paid off and Fredrik was admitted to Golani, the brigade he had aimed for all along. In March he started training. ...He has always been completely honest about his Christian faith and says that it has never caused any problems or conflicts with his fellow soldiers. "I feel especially close to the religious Jews in my unit. They say that I have an interesting relationship with God," he says with a smile. "I think we challenge and inspire each other. They know a lot of Talmud, while I know more Bible. It triggers them to learn more, and their knowledge triggers me to learn more, but at the same time I respect their faith completely and they respect my faith completely. We are not trying to change each other. And there is a lot we have in common. On Saturday evening when the guys gather to sing as Shabbat departs, I sing with them. We sing to God together, we sing our hearts out. I feel the Holy Spirit so strongly when I join them." The world is already aware, at the soul level, that Israel is rising among the nations and they are all hot to climb on board, by whatever means. There is a Torah-prescribed method for that, but they want to enter through the back door, not the halachic one. (IsraelNN.com) The United Torah Judaism party is trying to appeal to Arab voters who feel Israel is Our Home leader Avigdor Lieberman is racist. Party activists distributed flyers in Arabic with the title “Ultra-Orthodox Jews for Equality,” according to Yediot Achronot. UTJ MK Moshe Gefni explained, “We are against racism. We are for the Torah, in which it is written, ‘You should love the stranger, for you were strangers in the land of Egypt.’” Gefni also explained that his party is against Lieberman’s idea of a law which would require citizens to be loyal to the state. Yes, it's Tu b'Shevat, the New Year for the Trees. It's also my birthday and it's my custom to give gifts to those I care about, so here are my gifts to you on my birthday. Our sources advise us to do our best to tread the middle path. The main reason is that many dangers lie at either extreme. Those who claim the "right" path, the political "right," have no trouble seeing the error of their brothers on the left. The so-called left-wing in Israel aids and abets our enemy on the right---Yishmael---in the name of secular humanism. But the so-called right-wing in Israel aids and abets our enemy on the left---Eisav---in the name of Torah with the stated aim of "being a light to the nations." Why do the Jewish people always feel the need to have allies? Is HKB"H not enough for us? 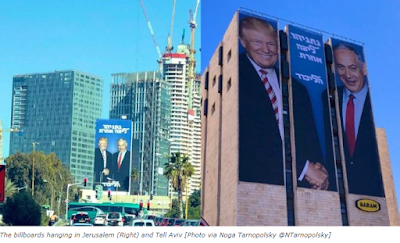 The political religious right-wing in Israel has allied itself with the political right-wing in America. And it is primarily young, modern, English-speaking olim who have jumped forward to assume the leadership of A7's English programming which admittedly caters to xians and accepts a large part of its funding from them. They are mentored by teachers of similar background who are proponents of what they call the Universal Torah. As such, they bring a very westernized, assimilationist approach to what constitutes "being a light to the nations." It follows the xian missionary proposition that the covenant-bearer has an obligation to go out into the whole world to bring the gospel of Torah to the nations. I believe that this is not only untrue, but self-destructive. “As is well-known, the fact is that there is no party today waving the banner of the Entirety of the Land of Israel except for the Ichud HaLeumi (National Union). Leading the list is Yaakov HaCohen Katz (Ketzaleh), who has proven in deeds his total dedication and loyalty to the Land of Israel for decades. The next two candidates, Mr. Uri Ariel and Prof. Aryeh Eldad, have over the course of many years proven their absolute loyalty to the Entire Land of Israel. “Fourth on the list is Dr. Michael Ben-Ari, the representative of the Our Land of Israel movement on the National Union list. 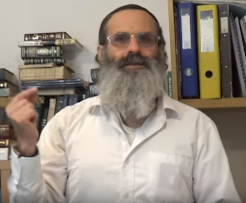 Dr. Ben-Ari, who was chosen for this task by Rabbi Shalom Dov Wolpe and Rabbi Baruch Marzel, will express in the Knesset the firm position of the Lubavitcher Rebbe regarding the Greater Land of Israel and the integrity of the Nation and the Torah. After he appeared before us and we talked for a long while, we determined that he is worthy of publicizing the holy opinion of the Rebbe in all matters on the public agenda, and he will in fact follow the rabbis’ decisions in all matters. “It is therefore our opinion that every man and woman of our brethren in Israel must vote for the Ichud Leumi (National Union) party, whose symbol is the letter tet, and influence all those who will listen to them to do the same. Heaven forbid that they should vote for any other of the parties, all of which have proven in the past that they were partners to giving away land, releasing terrorists, and making concessions that have placed the lives of millions of Jews in the Holy Land in danger. "...signed by Rabbi Gedaliah Axelrod, former Rabbinical Court President and the rabbi of the Chabad community in Haifa; Rabbi Shalom Dov Wolpe, author and head of the Task Force for the Land and Nation; and Rabbi Yigal Pizem, founder of yeshivot and Chabad institutions in northern Israel." (IsraelNN.com) The White House confirmed last week that President Bush did not reject Jonathan Pollard's petition for a pardon as he left office. Bush chose to reject some of the pardon petitions, but others, such as Pollard's, he left active. The Committee for Pollard's Release explained that Bush's decision means that Pollard can still be released at any time. They called on the next Prime Minister of Israel to make a clear statement that Israel will work for his release. (IsraelNN.com) Next week's election is pressuring the government to bring home kidnapped IDF soldier Gilad Shalit, nearly 1,000 days after he was kidnapped. Kadima and Labor have a wary eye on the polls, and outgoing Prime Minister Ehud Olmert wants to leave office with a major accomplishment. It's still a week away, but this is the last thing I want to say about elections on this blog. It's not my favorite subject. As I wrote yesterday, I do not believe that it is possible to bring about a real, Torah-oriented, Jewish government through the current electoral system. It is my firm belief that it is broken and too flawed to fix; that it needs to be scrapped entirely and replaced. However, given the present circumstances, I think there is little to no hope that enough people can be convinced of this in order to bring about positive change through a vote boycott. In the absence of a concerted campaign to undermine the "democratic" system, failure to vote will simply be interpreted as apathy. Given that and the fact that we have been presented with an opportunity to send a message to a watching world that we will not accept their diktat of another Arab state on Jewish land; that we will not accept another expulsion of Jews from their homes. Even though it is far from our ideal, nevertheless it will make a kiddush Hashem to in essence poke a finger in the eye of the US and the EU (and yes, also Bibi and Barak and Tsipi et al) and to strengthen all people of truth and courage by voting " ט "---Ichud Leumi ---the National Union. It is crucial that we send a message at this time---the message that there are Jews here in Eretz Yisrael who refuse to bow before the nations; who refuse to give in and give up the fight for our land. I will vote " ט " on Tuesday, February 10th. I hope you will, too. (IsraelNN.com) The National Union has received two ringing rabbinical endorsements over the past two days – from Rabbis Mordechai Eliyahu and David Abuhatzeira. I wrote a couple of weeks ago about the possibility of GW Bush being appointed US Peace Envoy to the Middle East and setting up an office here alongside Tony Blair who holds that same position representing the EU. I guess that was a bit overly optimistic considering the hatred the American public still feels for Bush, but Mitchell is old and he's sick. Give it a bit of time. After all, he's got half the name (George). And now he's setting up the shop. (IsraelNN.com) United States Middle East envoy Sen. George C. Mitchell has suggested he wants to set up shop in Jerusalem in his attempt to help Israel and the Palestinian Authority reach an agreement. Eleven predecessors have failed, and The New York Times's Thomas Friedman says he will be the 12th. Mitchell, whose mother left Lebanon at the age of 18 and whose father was the orphaned son of Irish immigrants, plans to return to the Middle East this month and wants to set up office in Jerusalem so his staff can monitor day-to-day events. I am not a Zionist as it is understood in the current vernacular. I am a Torah-abiding Jew who dwells in the Land of Israel and dreams the Dream of Zion---a redeemed people of G-d streaming up to the redeemed city of Zion from which the Torah Truth goes out to a redeemed world. The dream is real, but so far away, and drifting farther and farther from reach with every day that passes. Today, we are Jews living in the Jewish homeland with Jerusalem as our acknowledged capitol, but oy! to us, for we have no Jewish government! We have ceased to grow and expand and flourish with Jewish life. Instead we are shrinking and shriveling, barely existing under the administration of a non-Jewish, parasitical regime, which is sucking us dry. Twenty years ago, forty years after the founding of the modern State of Israel, the Dream of Zion was close enough to touch. Rabbi Meir Kahane was sitting in the Knesset and his Kach party, which faithfully represented authentic Jewish values, was poised to grow to anywhere from 10 – 17 seats in the Knesset. His popularity was growing as his message about relocating the Arabs spread far and wide. Had the people of Israel really possessed any “democratic rights” to elect their chosen leaders, there would never have been an Oslo or its tragic history. Instead, the sham of “democracy” was overturned by a collusion between Shas and Likud with the approval of the rest and the Kach party was ruled as “racist” and banned as a political party one month before the election. The people did not adequately protest this denial of their “democratic” rights, so the dream faded and drifted aloft through the smoke of suicide bombings. There is a popular phrase in Israel: “Today, everyone knows Kahane was right!” And indeed he was, like a prophet from our Tanakh, he foretold everything just as it has occurred. He was right about something else, too. He said, that if we would be denied our “democratic rights,” to vote on the issues, the only option left to us would be revolution. Try to look at the big picture and understand how much things have changed. Today, we are in a similar place to where we were twenty years ago with Avigdor Lieberman’s Yisrael Beiteinu poised to get 10-17 seats based upon his well-publicized calls to separate from the Arabs, BUT...! He intends to do it by chopping off all the parts of Eretz Yisrael where Arabs are living, not by removing them from our land! Every major party now “accepts” that there is “no military solution” and that there “must” be another Arab state cut from the very heartland of our homeland and it must be Judenrein, requiring the undemocratic expulsion of literally hundreds of thousands of more Jews from their homes, lands, businesses, schools and synagogues. Oh, and it “must” be “contiguous” with Gaza since no state can be viable if it is cut in half, despite the fact that it will render Israel UNcontiguous in the process. Twenty years ago, it was a crime to talk to the PLO. Today, the world is divided on whether to have diplomatic relations with Hamas!! Look how much ideological ground we have lost! And we are losing more and more every day, every week, every month, every year. We have gone from no such people as Palestinians to the everyday reference to a place called “Palestine,” as if it really existed. The Dream of Zion is now standing at such a great distance that absolutely nothing we can do politically at this point can bring it any closer to fulfillment. Nothing! In fact, the greatest danger that confronts us now is our blindness to that reality. As long as we believe in the political process, in democracy, in this party or that one, we risk waiting too long to effect the real cure for what ails us. Please wake up! Open your eyes and see that the regime ruling in Israel is “a broken cistern which can hold no water.” (Jeremiah 2:13) Everything that you are pouring into it is seeping out into the ground and in the end it will be just as empty as at the first. The answer is not to choose the lesser of the evils, because that is not why Hashem brought us back here after two thousand years. The answer is to stop giving legitimacy to the system by participating in it and to formulate a plan to replace it. There is more than one way to have a revolution. Let’s begin by having a simple revolution in our way of thinking. Let’s begin by returning to the Dream of Zion where a descendant of David rules as King under the authority of a restored Sanhedrin. And don't say that it's unrealistic. Realistically, we are headed for oblivion. The Dream of Zion is the only real reason for our survival. More and more, the world's attention is being drawn to Jerusalem and the Temple Mount. Have you heard of the JerusalemProject? It's a Xian effort that magnanimously allows Jews and Muslims a share in their vision due to their connection with Avraham Avinu. All of these people who stress our "common heritage" claim it through Avraham and conveniently leave out the fact that the Torah which informs us about the promises made to Avraham Avinu also states that the promises were passed on to Yitzchak and from him to Ya'akov and the Children of Israel. It is suspected by many scholars that The Ark of The Covenant is still there, hidden somewhere beneath the city. They are correct. When the archeology is done on the site, The Ark of The Covenant will be found there, where it has been all along. For too long, antagonism and distrust have kept the experts from doing the archeology on one of the most important sites in human history. The time has come to build a world-class religious convention center in Jerusalem, according to the prophetic tradition. There are to be no gold or silver icons in this Facility, which shall be for all the people of all the nations. Just as the federal government of the United States created the District of Columbia, the United Nations can create The Jerusalem Jurisdiction, in order to do the archeology, find The Ark and build The Creator's House.